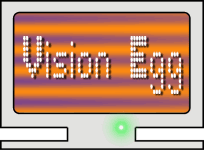 The Vision Egg is a programming library (with demo applications) that uses standard, inexpensive computer graphics cards to produce visual stimuli for vision research experiments. Our docs are hosted at Read The Docs. Our releases are hosted at PyPI. Our source code is hosted at GitHub.